CONCORD, N.C. (Aug. 8, 2018) – Chip Ganassi Racing (CGR) announced today that Justin Marks will return to pilot to the No. 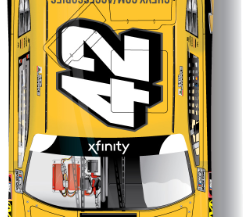 42 Chevrolet Camaro SS in the NASCAR Xfinity Series (NXS) road-course races at Mid-Ohio (Aug. 12), Road America (Aug. 26) and the newest road-course on the series’ schedule, Charlotte Motor Speedway (Sep. 29). Chevrolet Accessories, will serve as a primary sponsor for all three races. Back to History: Marks’ first of three races this season will take place at Mid-Ohio Sports Car Course, where he led 43 of the 75 laps en route to his lone series victory in 2016 for Chip Ganassi Racing. Ready to Seize the Opportunity: Marks has competed in many forms of road-course racing as well as in all three of NASCAR’s national series, the Monster Energy NASCAR Cup Series (MENCS), NXS and NASCAR Camping World Truck Series (NCWTS). He was also part of the winning team in the 2009 Rolex 24 At Daytona in the GT division. This year, Marks has competed in seven races in the WeatherTech Sports Car Championship, scoring a podium in the GTD division at Belle Isle in June. Man of Many Talents: An accomplished entrepreneur, Marks is the owner of The Drylake Group, a sports and entertainment development company, GoPro Motorplex and KartSport North America. Marks has also been a car owner in both the World of Outlaws and a NASCAR K&N Pro Series East team where he was part of two-consecutive championships in 2015 and 2016. · Doug Duchardt, Chief Operating Officer, Chip Ganassi Racing: “We are excited to extend our partnership with Chevrolet Accessories to include these three races with Justin Marks. Justin has always done a nice job on the road courses, so we are happy to have him back in the No. 42 Camaro. The 2016 race at Mid-Ohio was a special race for Justin to claim his first NASCAR Xfinity Series victory in the Chip Ganassi Racing car and I know that he has the tools to try and make that happen again in these upcoming races”.